In July 2016 it was revealed that British workers have suffered the joint biggest post-crisis collapse in the real value of the wages anywhere in the developed world. The only other country in the OECD to have experienced a such a severe decline in workers' wages is crisis-stricken Greece. New data from the OECD puts this astonishing collapse in the value of UK workers' wages into an ever harsher perspective. 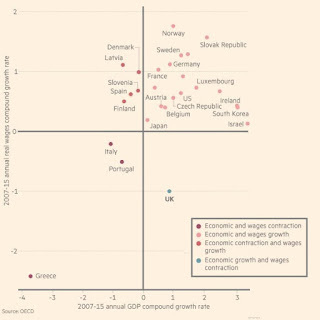 Aside from suffering the joint worst wage collapse in the developed world, the UK is the only developed economy in which wages fell while the economy was actually growing. 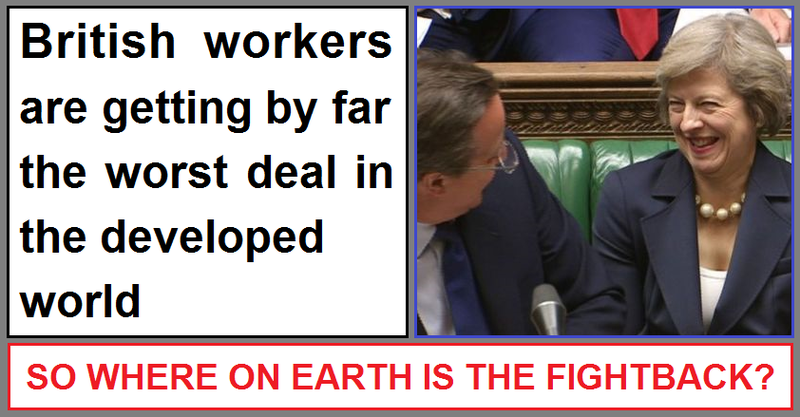 UK workers have been given an uniquely bad deal. There's no other developed nation where workers' wages were systematically eroded while the economy was actually expanding. One of the most significant causes of the unprecedented decline in UK workers' wages is the replacement of "real" full-time jobs with part-time, zero hours and gig economy contracts. Since 2010 only around a third of new jobs have been full-time paid positions, with the rest being part-time or self-employment. 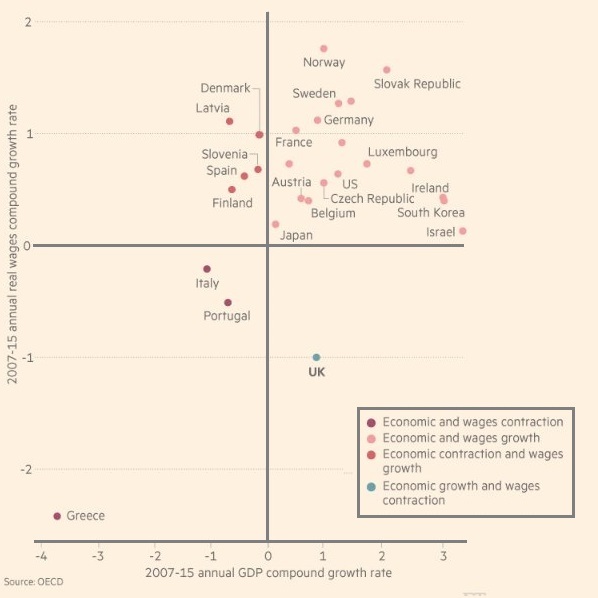 The UK economy has been shifting from being a high-skill high-pay economy, to a low-skill low-pay one. Between 2007 and 2015 the number of managerial positions in the UK economy fell by 24%, while the number of low-skilled jobs increased by a similar amount. One of main causes in the UK's unprecedented wage collapse has been the socially and economically ruinous Tory austerity agenda. Ideologically driven cuts in government spending have resulted in the abolition of hundreds of thousands of decent well-paid jobs, while the public sector pay freeze has inflicted below inflation pay increases on millions of workers. 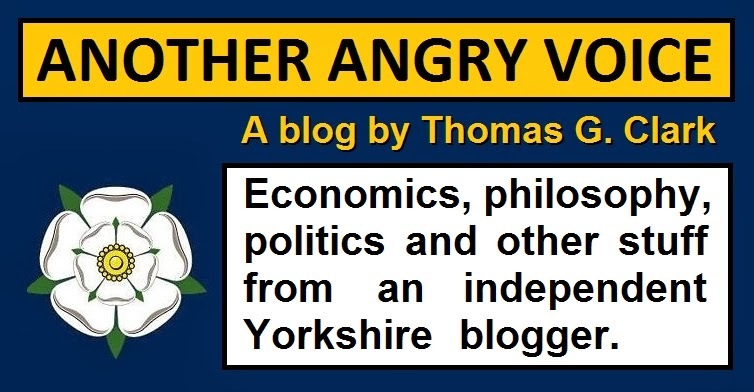 People who have been indoctrinated by the right-wing press into jealously hating public sector workers might be inclined to celebrate the Tory assault on public sector jobs and wages, but only if they're grotesquely ignorant of the knock on effects in the private sector. If tens of thousands of high-skill public sector jobs are needlessly abolished, it doesn't take a genius to understand that the competition for high-skilled private sector jobs is going to be significantly increased, meaning fewer job opportunities for well-paid private sector positions. Neither does it take an economic visionary to understand that deliberately repressing wages in the public sector gives unscrupulous private sector employers the ideal excuse to impose wage repression schemes of their own. People have argued for a long time that Tory austerity is nothing more than a deliberate wealth redistribution con, where inequality promoting policies are dressed up in "there is no alternate" propaganda which is subjected to almost no serious scrutiny in the politically biased mainstream media. Austerity wasn't ruthlessly forced on the UK by the European Union and the IMF like it was in Greece, Spain, Portugal and Ireland, it was purely a matter of choice from a Tory government who saw the fallout from the global financial sector insolvency crisis as the ideal opportunity to push their hard-right economic agenda (tax cuts for the rich, welfare cuts for the poor, more privatisation scams, destruction of public services ...). The fact that UK workers have suffered a uniquely bad deal is yet more proof that, from their own perspective, the Tory wealth redistribution scam called austerity has been a roaring success. The UK wealth pie has got bigger over the last eight years, but the slice that workers end up with is somehow significantly smaller than the slice they were getting when the pie was smaller before the economic crisis. There's no doubt whatever where all of the extra wealth has been going. While UK workers have suffered the worst sustained decline in the value of their wages in recorded history the super-rich minority have literally doubled their wealth. The rate of in-work poverty has soared to a record high. 3.8 million working people now live in poverty. 66% of children living in poverty live in working households, and the super-rich elitists that the Tory party exists to serve are laughing all the way to the bank. One of the most common explanatory narratives about Donald Trump's election win was that it was driven by the anger of "left behind" US workers. While there is some sense behind this explanation (the wealth of the US middle class has been under erosion for the last four decades) the evidence shows that like France and Germany, the US is one of the majority of countries where both the economy and wages have grown since the financial sector meltdown. The UK is in the unique position of being the only developed nation where the country got richer, but the workers got poorer. To put the meek and passive reaction of British workers into perspective, just imagine the reaction of the French if they were being shafted in the same way. Who thinks there wouldn't be huge strikes, mass protests and riots in the streets if French workers were being treated half as badly as British workers are currently accepting? I often like to conclude my articles with some glimmer of hope, or some positive action that can be taken to fight back against the injustice, but when it comes to the way UK workers have been so badly shafted, and their pathetically meek acceptance of the uniquely poor deal they've been subjected to, well, there's only one explanation. There's something catastrophically wrong with the British psyche. Not only have British workers failed to fight back against this uniquely bad deal, the political party that has been orchestrating this massive upwards redistribution of wealth is riding so high in the polls that they appear almost untouchable. Theresa May has an astounding 49% approval rating. A huge number of British people are clearly a bunch of pathetically subservient forelock-tuggers who adore the savage aristocratic class who ruthlessly exploit them and administer one merciless beating after another. If the British won't fight back when they're demonstrably suffering the worst deal in the entire developed world, what hope is there? * Don't even dare say "Brexit is the fightback" because handing even more power to the Tories who have been shafting British workers so ruthlessly is obviously totally the opposite of a fightback. I didn't send out a Tweet!